Retired Chief Inspector Gamache becomes Commander of the Surete Academy in hopes of wiping out the last traces of corruption infecting the Sûreté du Québec. But his choice of professors seems ill advised with two who clearly had been involved in the wrongdoing. Also, the reader is greatly puzzled why Commander Gamache decides to admit a freshman, previously rejected for good reason, just because he recognizes her name. 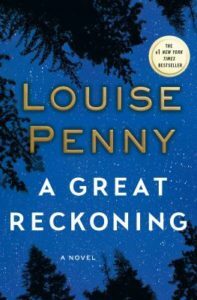 As expected with Louise Penny’s mysteries, the interesting characters of Three Pines come into play, this time in regards to an old map found in the wall of the Bistro and as hosts to the unlikely freshman and three other cadets for whom Gamache has special interest following the violent death that befalls the Academy. A Great Reckoning brings out hope for redemption, forgiveness, and justice in answer to the misdeeds of the past. Check out The New York Times list on the “latest and best in crime fiction,” which includes a nod to A Great Reckoning.